In 2008, at the University of New South Wales (UNSW), there were around 70 free-roaming cats living on campus. 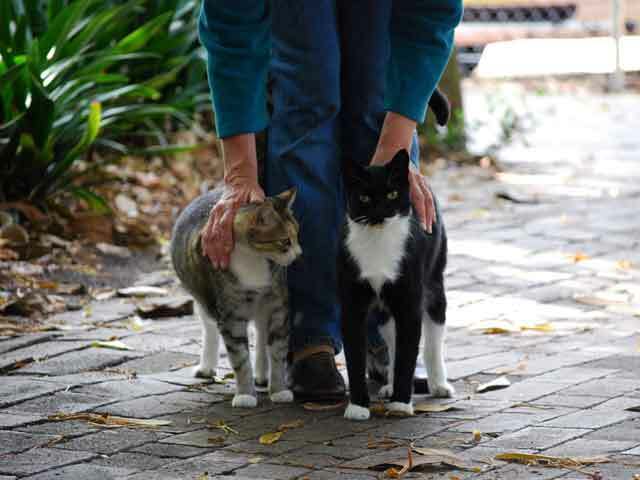 To reduce and control their numbers, a staff member of the university, Dr Helen Swarbrick, worked to implement an effective TNR program, together with a group of volunteers called the Campus Cat Coalition. Over the course of the first year-long trial, the campus cats were audited, registered, desexed and vaccinated to improve their overall health. The program volunteers also ensured that the cats were kept healthy by introducing daily feeding, shelter areas, and flea and worm medicine. Some of the tamer cats and kittens that lived on campus were put up for adoption and loving forever homes were found for them. All campus cats are in good health and fed on a daily basis. The Campus Cat Coalition’s program is still running today and the team has been actively educating and informing other university communities about its success. There is a Saving Pets article from 2009 called "The people you want to empower, won't help you kill" which featured the program and I wrote about it again for major distribution via PetRescue. The program was part of a panel at G2Z in 2013 featuring Professor Swarbrick, Professor Jacquie Rand, Dr Lila Miller, Professor Chris Dickman, Mark Kumpf, Dr Maggie Lilith and myself, entitled "How can we make TNR work for everyone?" By December 2009, when the program was due for initial review, the number of cats on campus had reduced from 69 to 51 cats, which represented a 26% reduction, meeting the 20% target agreed with the university. At the 5-year time point (September 2013), there were 30 cats remaining on campus, representing a 57% reduction, again meeting the agreed 50% target. Over the nine-year period, 122 cats in total were managed as part of the program. These comprised 69 original residents (57%), 16 unsocialized immigrants incorporated into the resident population (13%), 18 socialized immigrant adults and kittens (15%), and 19 kittens born on campus (16%). Socialized immigrant adults and kittens, and kittens born on campus, were targeted for rapid removal for rehoming or return to their owners. This left 70% of the total 122 cats (69 original residents and 16 unsocialized immigrants; total 85 cats) to be actively managed on an ongoing basis. The current campus cat population (at September 2017) comprises 15 cats, representing a 78% reduction in resident cat numbers from the original population of 69 cats in August 2008. Therefore, only 12% of the 122 cats managed through the course of the nine-year program remain on campus. Subsequent institutional support for the program was strong because of a reduction in complaints from campus staff and students, the minimal institutional costs, and the improved health status of the remaining cats, all of which are desexed, microchipped, registered and fed on a daily basis. I would recommend everyone who has an interest in either managing colonies or advocating for cats, take the time to read this paper. Not only does it deal with the details of this particular project, it counters many of the common arguments against TNR and provides an excellent background on TNR generally.